The 12 tips you are missing for the completion of the trek you've always dreamed of. 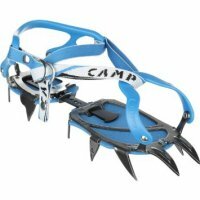 For those planning trips to mountain climbing classic medium commitment. It has a flexible structure to fit better in walking on ice and snow thus reducing fatigue. Flexibility achieved through the two rods that make up the connecting rod. Meets all requirements for adapting to any type of shoe, mountaineering and trekking through the three different systems available and a lacing system for quick adjustment of the measure.